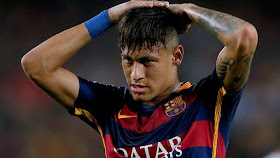 Barcelona may be about to lose their prized Brazillian forward, Neymar, if reports from Spain are true. Reports claimed the Neymar has accepted an offer from France’s Ligue 1 champions, Paris Saint-Germain, who are ready to pay his €222m release clause. It is believed that the Brazillian international has grown frustrated after Barcelona pulled out of a deal to sign Lucas Lima from Santos to provide him with a close companion at the Nou Camp. The 25-year-old only signed a new deal until 2021 back in October of last year and Barcelona stressed earlier on Tuesday that Neymar would “200 per cent” certain stay this summer.